About This Item We aim to show you accurate product information. Manufacturers, suppliers and others provide what you see here, and we have not verified it. 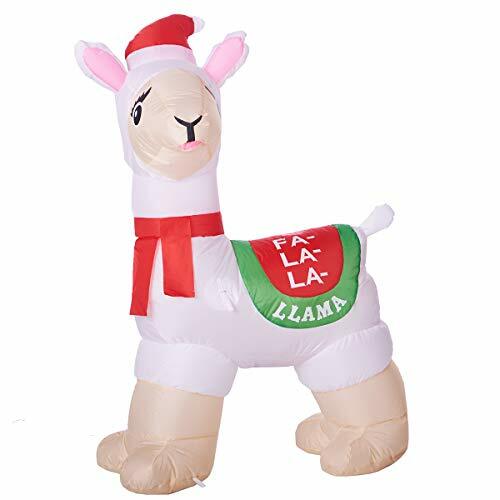 See our disclaimer Holiday Time Inflatable Llama helps you welcome the holiday season with good humor. This adorable llama has on a jaunty red Santa hat and a matching bright red scarf. This llama is wearing a its Christmas saddle emblazoned with "Fa-La-La-Llama" to tickle your funny bone. Place this holiday inflatable in your yard to elevate your outdoor Christmas display to delight your friends, neighbors and visiting carolers. It is perfect for use with other Holiday Time inflatables. The llama inflates to 3.5 feet tall. It inflates with blown air when plugged into a power source. Celebrate the season with Holiday Time Inflatable Llama.